Finally here at the Clinger Holster’s HQ, the weather has been warming up after an apocalyptic cold-snap. So, I wanted to talk closely about concealed carry during these warmer (and likely more active) months of the year. Most people don’t want to be strapping their 25 ounce (or more) pistol to their sides. That’s fine—but what are you going to carry? Well there’s a huge list here on the Clinger Blog of The 50 Best Concealed Carry Pistols of 2018. If you haven’t checked it out, or if you need some advice on what your secondary concealed carry pistol should be, then that link will serve you well. Back to the topic—well, this is the opportunity to take your favorite people and pistols to the range to get some trigger-time in on that pistol you haven’t been carrying for a few months. And this is also prime time to switch out your concealed carry ammo that has been subjected to the Wiley-weather Mother Nature has been sending us. Warmer weather means intense heat which can also affect your concealed carry ammunition if you keep your pistol in the car when you go into those certain establishments that aren’t concealed carry friendly. Just keep in mind that you’ll need to be switching out your ammunition again in about 4 or 5 months. Also, when was the last time you took a real good look at that holster you’re using? I wrote a blog a few weeks ago about the concerns of carrying your pistol at home. If you are worried about being active with your kids and your pistol accidentally finding its way out of the holster, then you need to get yourself a new holster and STAT. I know many of you just want to either quickly slide your pistol IWB style without messing with adjustments. 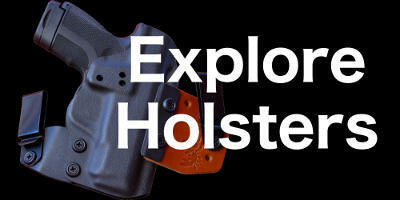 Clinger Hoslters offers a clipless, soft holster called our Comfort Cling. These holsters are also perfect for pocket carry—that is if you have big enough pockets to do so (I do not). Recently, thought, I have been carrying my .38 revolver in a Comfort Cling, so be on the look-out for a review from me, soon. How do you plan to concealed carry during the better weather? Let me know in the comments! We do have plans to introduce a pocket holster for smaller 380 pistols in 2019.